In a previous post, I discussed how I was watching the added sugar intake in my diet. It hasn't been as hard as I thought it would be, and I really do feel better because of it. I tried the different sugar substitutes on the market, but I couldn't get past the thought that they were artificial chemicals - something our bodies should not be ingesting. 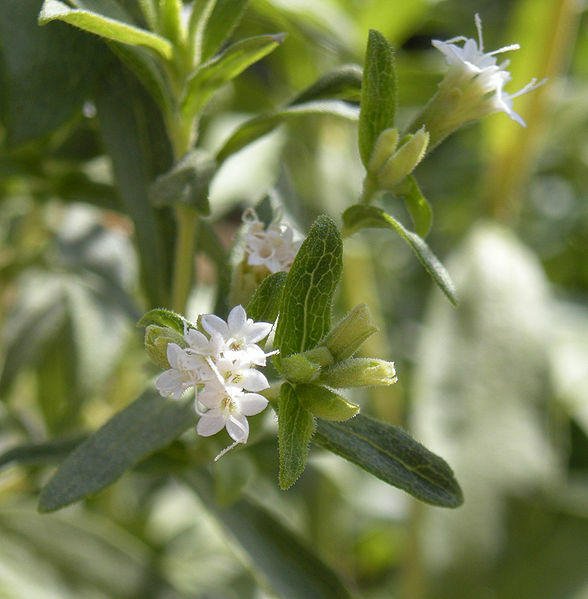 Even the stevia sweeteners on the market have been processed with additional ingredients. They are white and look like sugar. The natural stevia plant is green. So why not go straight to the source - the plant itself. I ordered some dried leaves and soaked them in some vodka for 24 hours. After straining it, it is ready to use. It only takes 1/2 a teaspoon to sweeten a 16 ounce cup of iced tea. With no calories and no affect on blood glucose levels either. And it is all totally natural. I think next time I will make it with water instead of vodka. It only lasts a couple if weeks in the refrigerator though, so it will have to be a smaller batch as the alcohol preserves the vodka method indefinitely. I am giving some thought to purchasing some seeds and growing it myself this summer. I am glad to have discovered it - it is amazing what mother nature provides!